Take a break from saving the galaxy and enjoy the greatest spectacle this side of the Outer Rim! 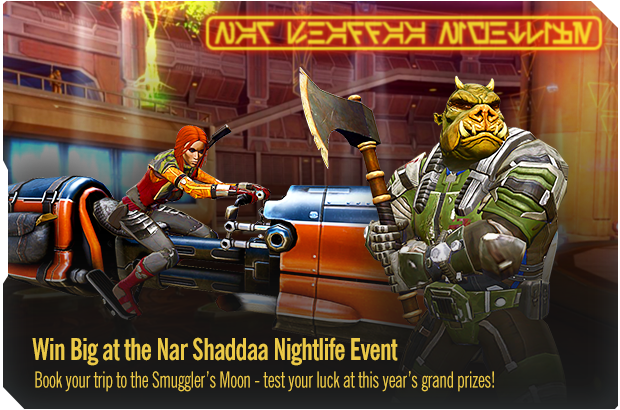 Godoba the Hutt and Czerka Corporation are proud to announce the return of the Nar Shaddaa Nightlife festival, running all summer-long! Test your luck on the slot machines at the exotic Star Cluster and Club Vertica Casinos, compete with other high rollers, and create unforgettable memories. Try your luck at this year’s grand prizes, including the Vectron Wraith speeder and Gamorrean bodyguard Companion! So book your trip to the Smuggler’s Moon today – the Summer of SWTOR is just getting started! New Companion Customizations: Customize the appearance of Theron Shan and Shae Vizla! You can now equip your favorite Republic agent and bounty hunter sidekicks with new looks – swap in new battle armor on the fly and play your way. Galactic Starfighter Updates: Gunship and Bomber starships are now available for all players, allowing newer pilots to jump in and dominate the skies! We’ve also boosted the rewards earned from space battles and added some exciting new ship customizations.